Addi and Cassi turned six years old on Saturday. Over two years ago when the twins were diagnosed with Niemann Pick Type C disease, I was not sure they would still be with us today. Our little angels are amazing fighters and doing very well on their cyclodextrin infusions. Here is the ice cream cone cake Grammy Helen and Mommy put together to celebrate their birthday milestone. 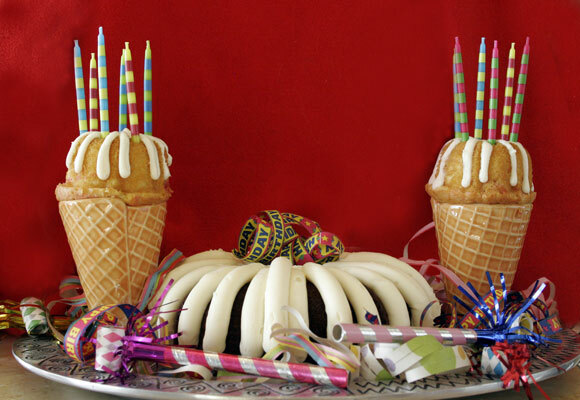 We purchased the bundt cakes at Nothing Bundt Cakes and used ice cream waffle cones from Williams-Sonoma and a fun plate and streamers to top it off. Addi and Cassi normally don’t ingest much cholesterol but this cake was surely loaded with eggs, milk, butter, etc. A big birthday treat! Happy Birthday to Addi, Happy Birthday to Cassi, Happy Birthday sweet girls, Happy Birthday to you. Maks sure Mommy and Daddy give you lots of hugs! PS As your gift, I’m blogging about World Rare Disease Day and putting your photo on my post. Keep hugging! Happy Birthday you beautiful girls! We went to see the movie “Extreme Measures” tonight and couldn’t stop thinking about how much the movie paralled your lives! All our love to you both and your mom and dad and of course Grandpa Jim! XOXOXOXO Our thought and prayers are with you every day! THANKS SO MUCH for your support!!! !